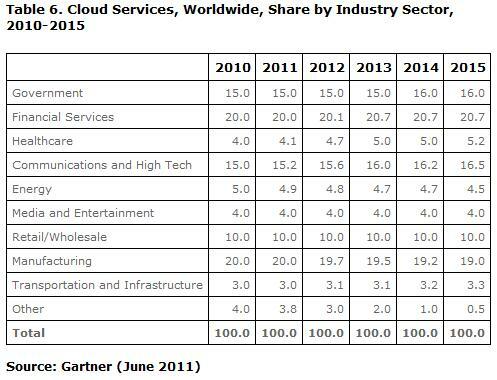 Source: Forecast Overview: Public Cloud Services, Worldwide, 2011-2016, 4Q12 Update Published: 8 February 2013. 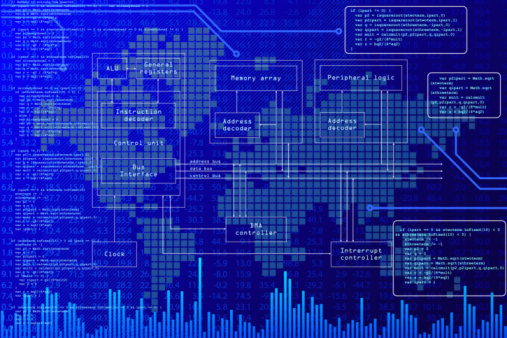 The latest round of cloud computing and enterprise software forecasts reflect the growing influence of analytics, legacy systems integration, mobility and security on IT buyer’s decisions. Bain & Company and Gartner have moved beyond aggregate forecasts, and are beginning to forecast by cloud and SaaS adoption stage. 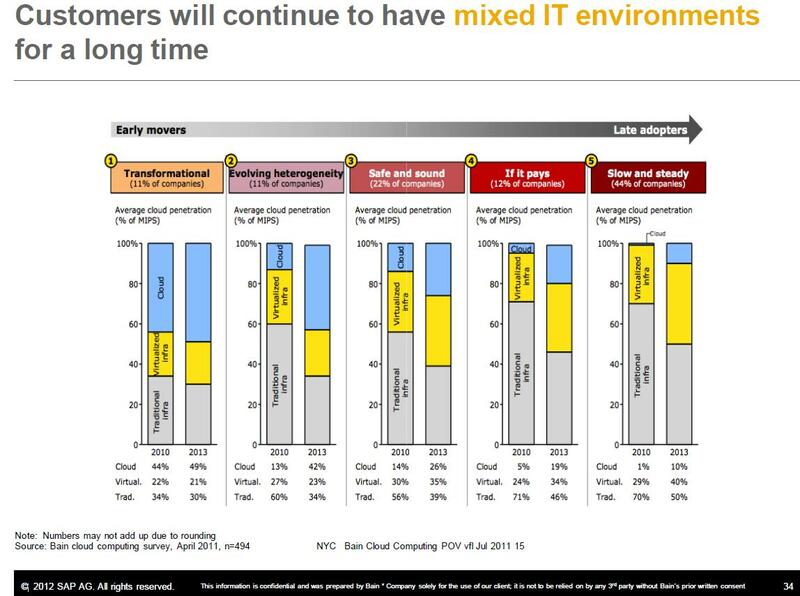 SAP is using the Bain adoption model in their vertical market presentations today. Despite the predictions of the demise of enterprise software, forecasts and sales cycles I’ve been involved with indicate market growth. Mobility and cloud computing are the catalysts of rejuvenation in many enterprise application areas, and are accelerating sales cycles. Presented in this roundup are market sizes, forecasts and compound annual growth rates (CAGRS) for ten enterprise software segments. 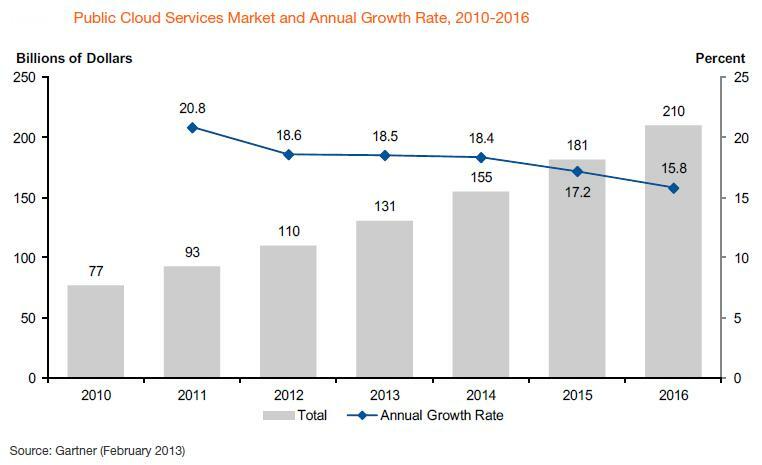 Software as a Service (SaaS) and cloud-based business application services will grow from $13.4 billion in 2011 to $32.2 billion in 2016, a five-year CAGR of 19.1%. 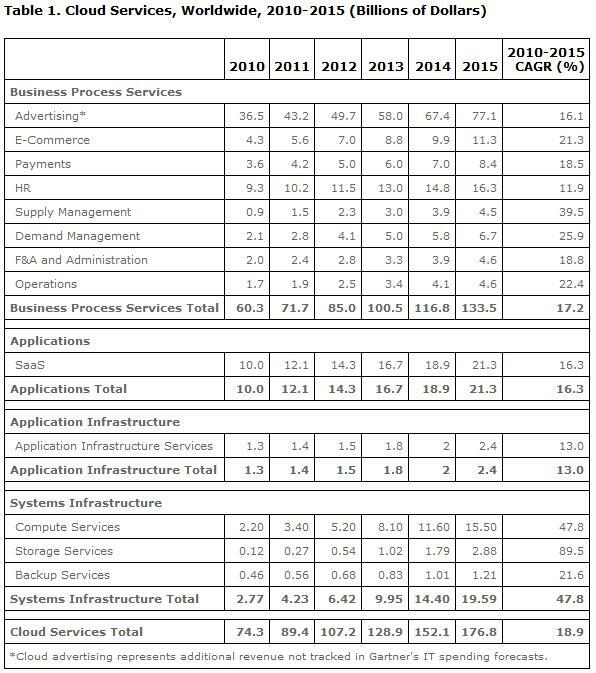 Source: Market Trends: Platform as a Service, Worldwide, 2012-2016, 2H12 Update Published: 5 October 2012 ID:G00239236. According to the Cisco Global Cloud Index, global cloud traffic will account for nearly two-thirds of total data center traffic by 2106. 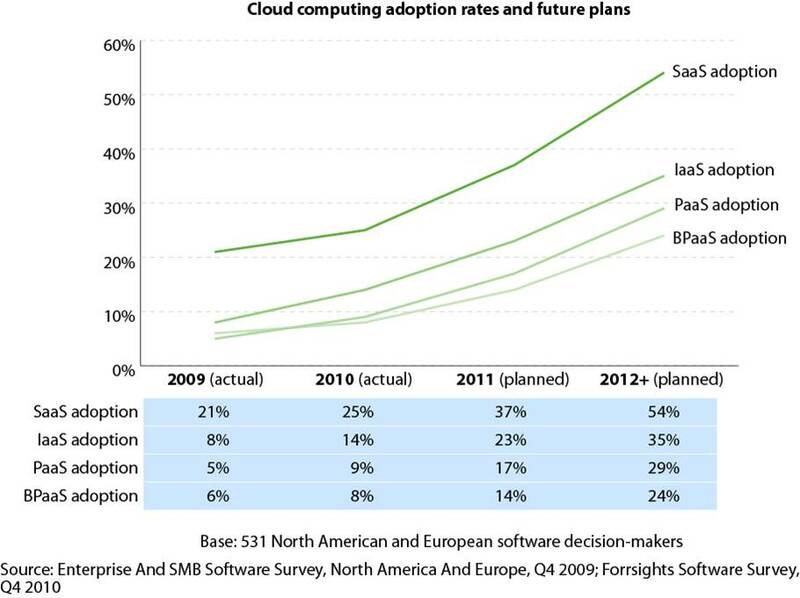 Cisco is forecasting cloud traffic as a percent of total data center traffic will grow from 39% in 2011 to 64% in 2016. 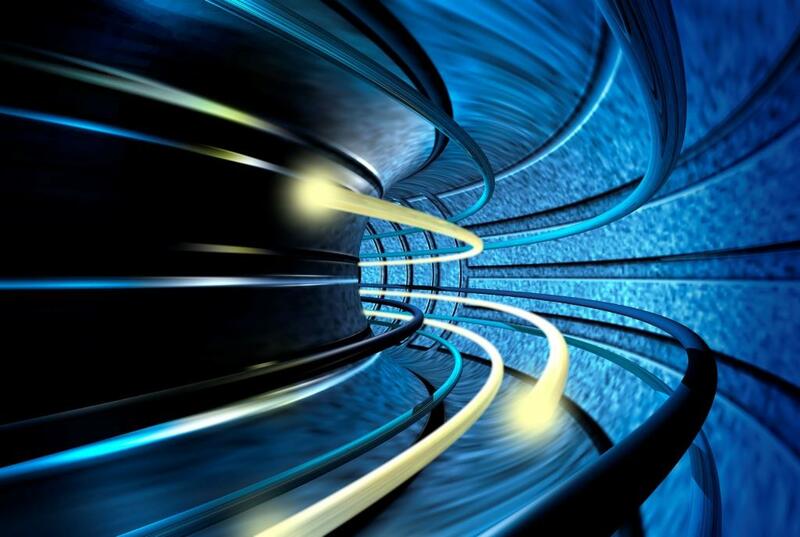 Cisco is also predicting that by 2016, three out of five data center workloads will be processed in the cloud. The Cisco Global Cloud Index also includes many insightful documents including the Cisco Global Cloud Index: Forecast and Methodology, 2011–2016 and the Cisco Global Cloud Index Supplement: Cloud Readiness Regional Details. 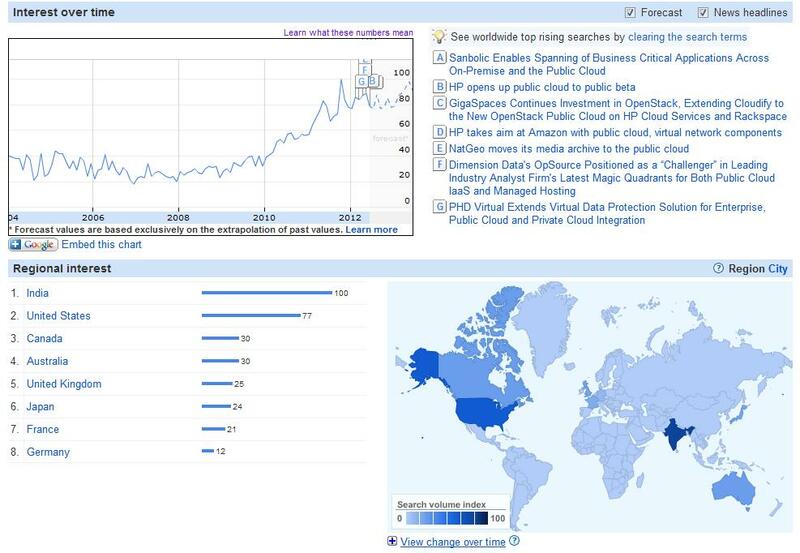 The following video provides an excellent analysis of the Top Trends behind the Cisco Global Cloud Index (2011 — 2016). 11% of companies are transformational, early adopters of cloud computing, attaining 44% adoption (as defined by % of MIPS) in 2010, growing to 49% in 2013. 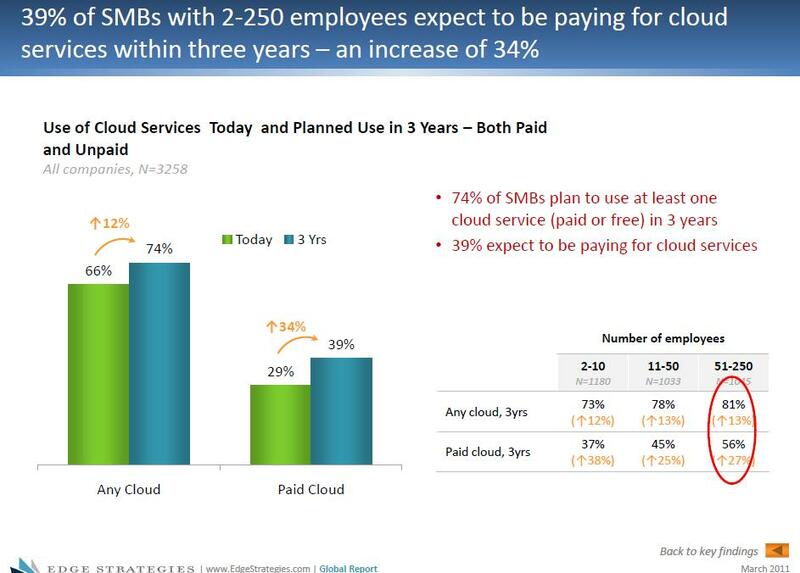 This same segment will reduce their reliance on traditional, on-premise software from 34% to 30% in the same period according to Bain & Company’s cloud computing survey results shown below. SAP is using this adopter-based model in their vertical market presentations, an example of which is shown here. Bain and Company has defined a Cloud Go-To-Market System and is actively promoting it in their research insights and other publications. Examples of Bain’s research on cloud computing include Selling the cloud, The five faces of the cloud, How Rackspace turns customers into brand fanatics, and Identifying and monetizing cloud computing’s five customer types. 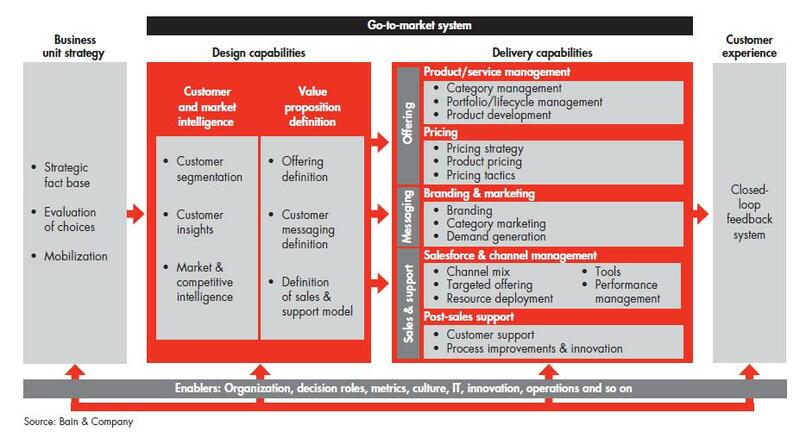 The Bain and Company Cloud Go-To-Market Strategy framework is shown below. 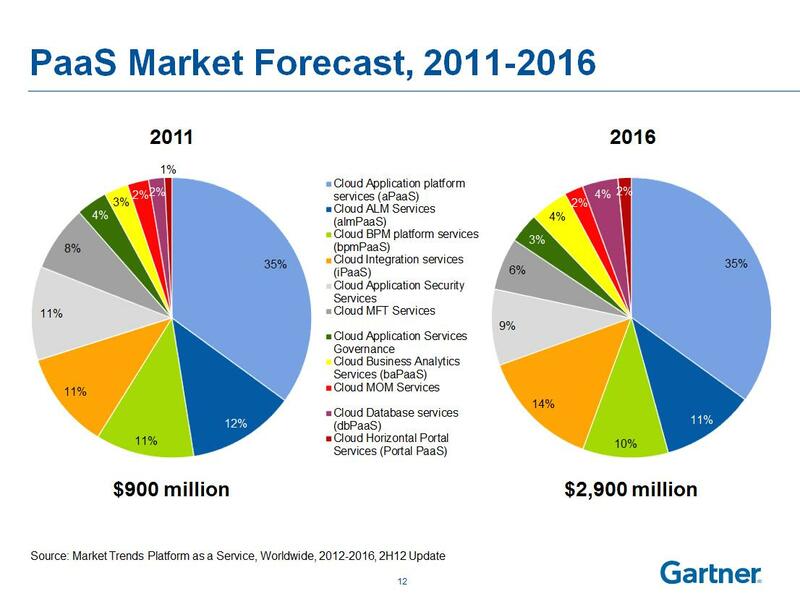 Gartner is predicting Infrastructure-as-a-Service (IaaS), cloud management & security devices, and Platform-as-a-Service (PaaS) are growing from $7.6B in 2011 to $35.5B in 2016, a CAGR of 36%. 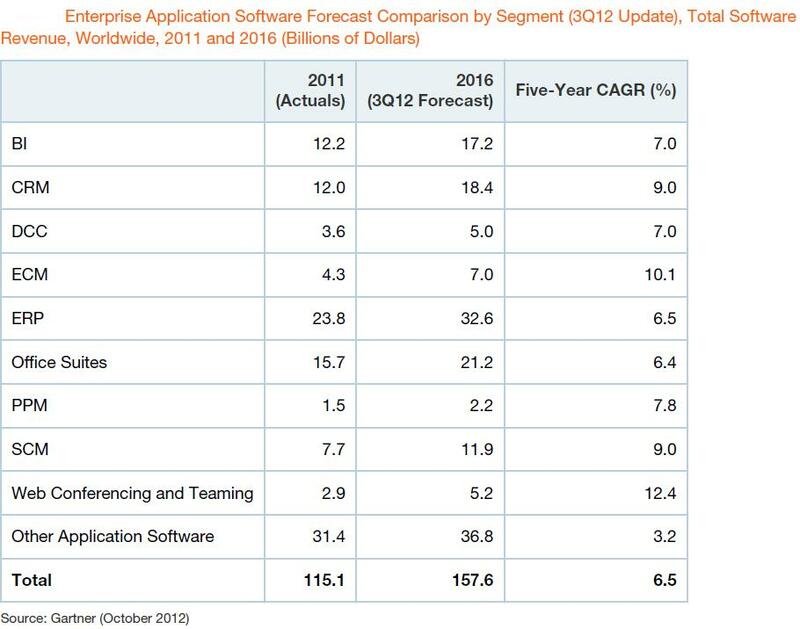 Source: Forecast Analysis: Enterprise Infrastructure Software, Worldwide, 2011-2016, 3Q12 Update Published: 18 October 2012 ID:G00234775. 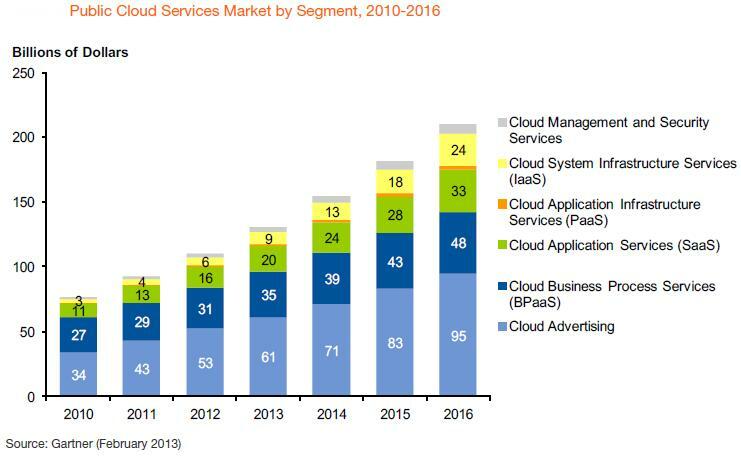 The global Platform-as-a-Service (PaaS) market is growing from $900M in 2011 to $2.9B in 2016, achieving a 26.6% CAGR. 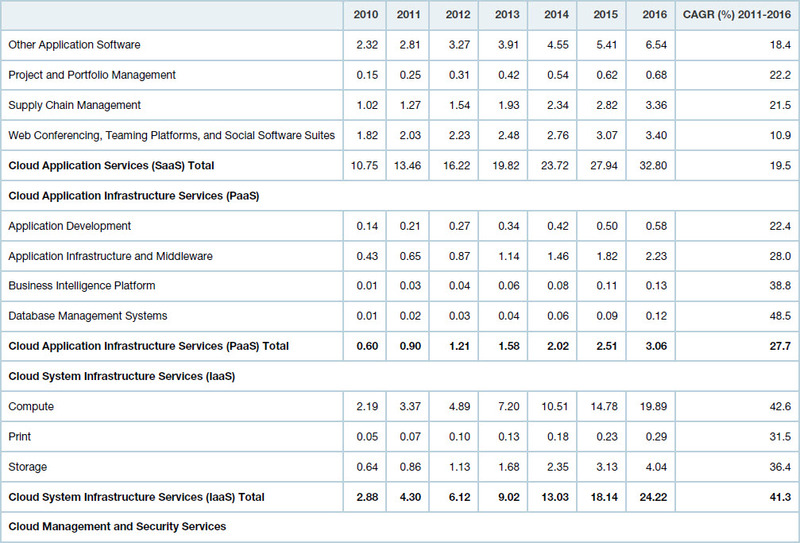 At this projected rate, PaaS will generate an average of $360M a year in revenue between 2011 and 2016. 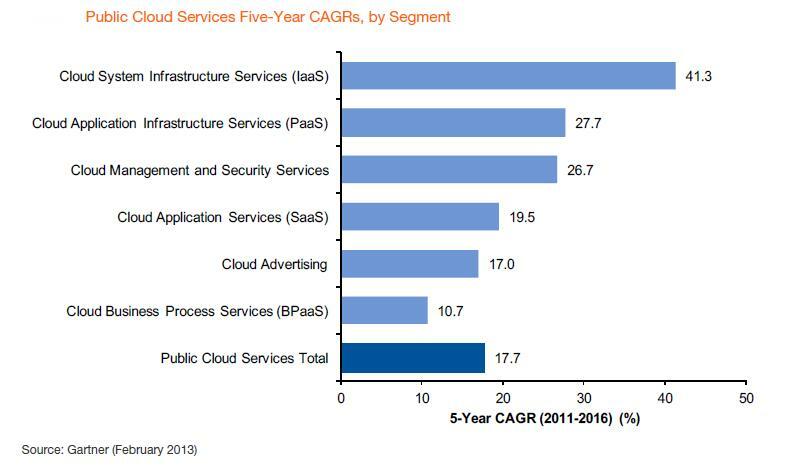 Gartner projects that the largest segments will be Application Platform Services (aPaaS) which generated 35% of total PaaS spending in 2011, followed by cloud application lifecycle services (12.5). 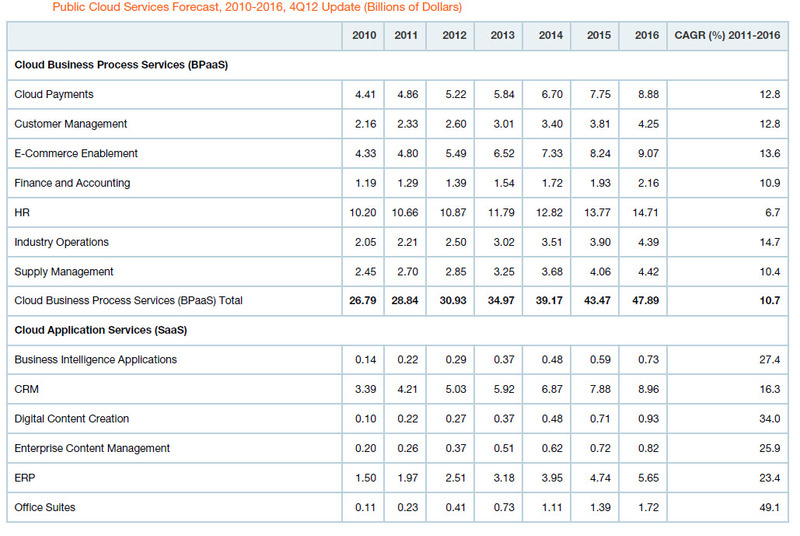 Source: Market Trends: Platform as a Service, Worldwide, 2012-2016, 2H12 Update Published: 5 October 2012 ID:G00239236. Serving the sales force is a mantra and mindset that resonates through the best companies I’ve ever worked with and for. 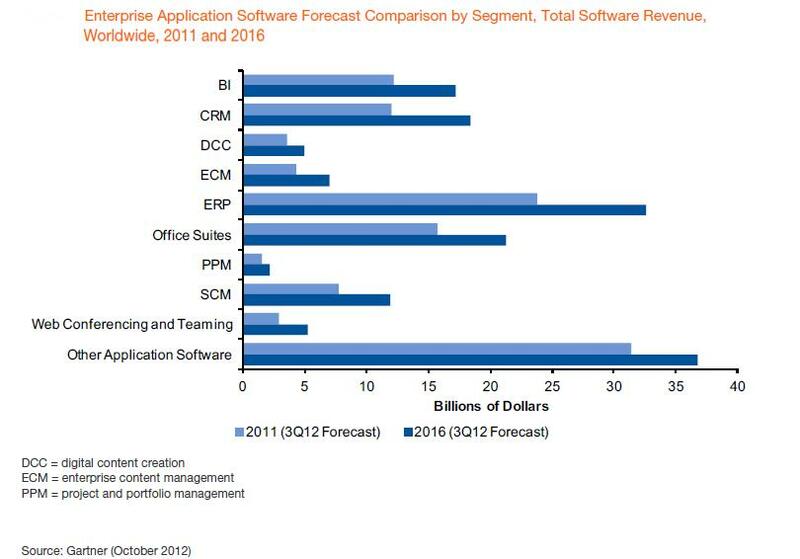 Software-as-a-Service (SaaS) delivery of CRM applications represented 34% of worldwide CRM application spending in 2011. More than 50% of all Sales Force Automation (SFA) spending is on the SaaS platform. Gartner clients who are successfully running SaaS are now looking at how to get value from Platform-as-a-Service (PaaS) in the context of selling strategies. 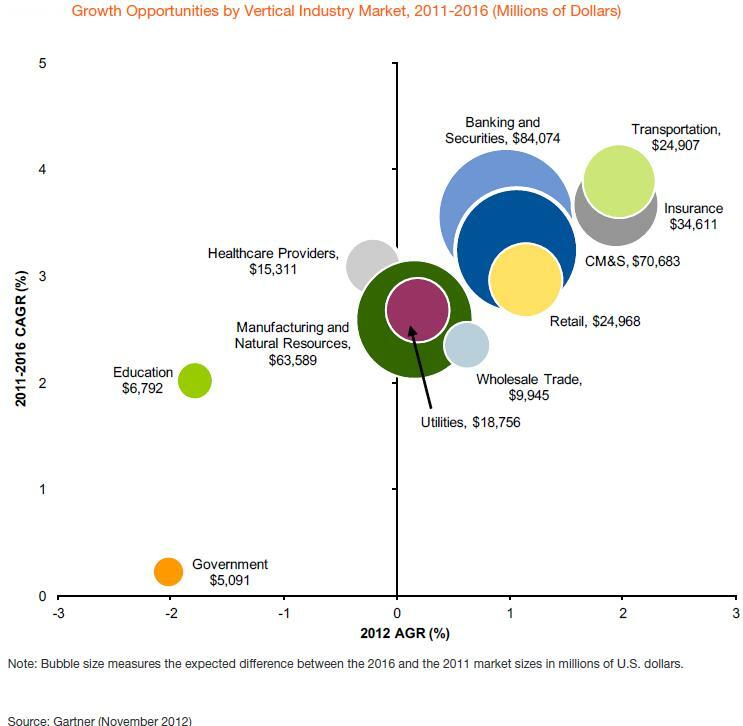 CRM spending grew 13% in 2011, fueled analytical, operational and social CRM growth. 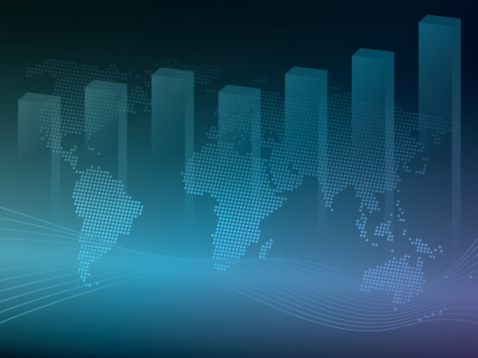 Operational CRM represents 80% of all CRM spending and grew 10% in 2011. Analytical CRM, in which Gartner includes predictive analytics and market segmentation analysis, grew a solid 10% in 2011 and is having a very strong year with inquiry traffic. 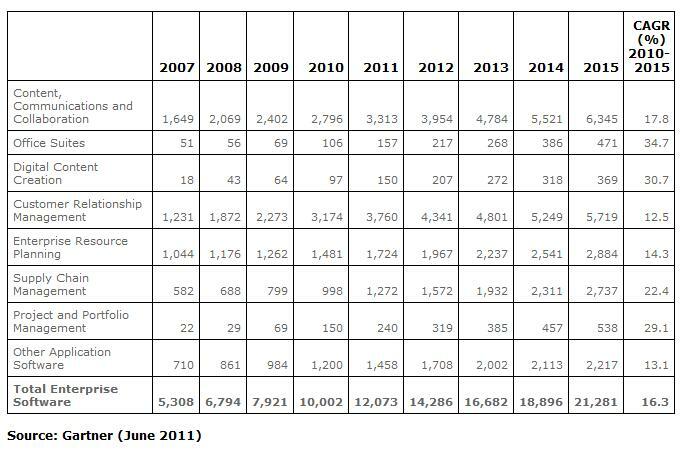 Social CRM grew 30% in 2011 in revenue terms and is 7% of total CRM spending globally as of 2011. 90% of Social CRM spending is originating in Business-to-Consumer (B2C) organizations with the remaining occurring in B2B. Gartner is projecting that CRM will be one of the top three search terms on Gartner.com throughout calendar 2012 based on the trends and volume of calls they are seeing today. 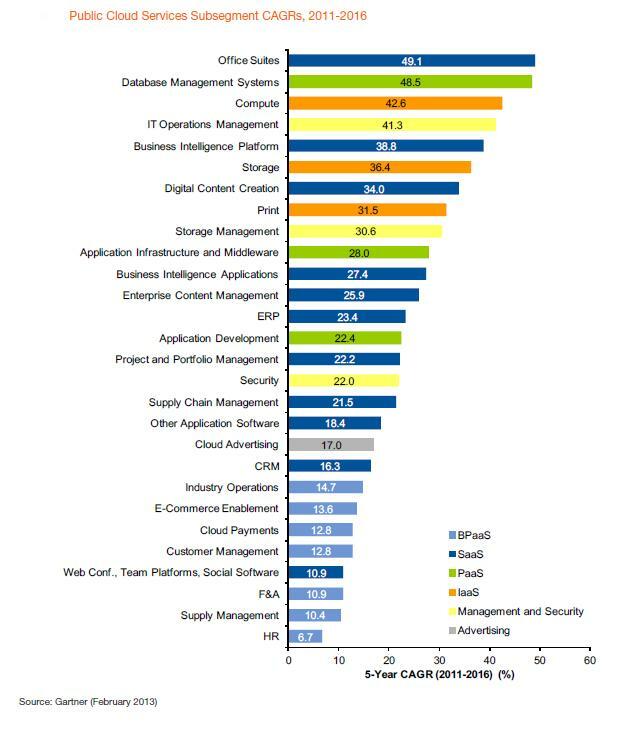 CEOs see CRM as their #1 technology-enabled investment in 2012 according the query calls through April, 2012. 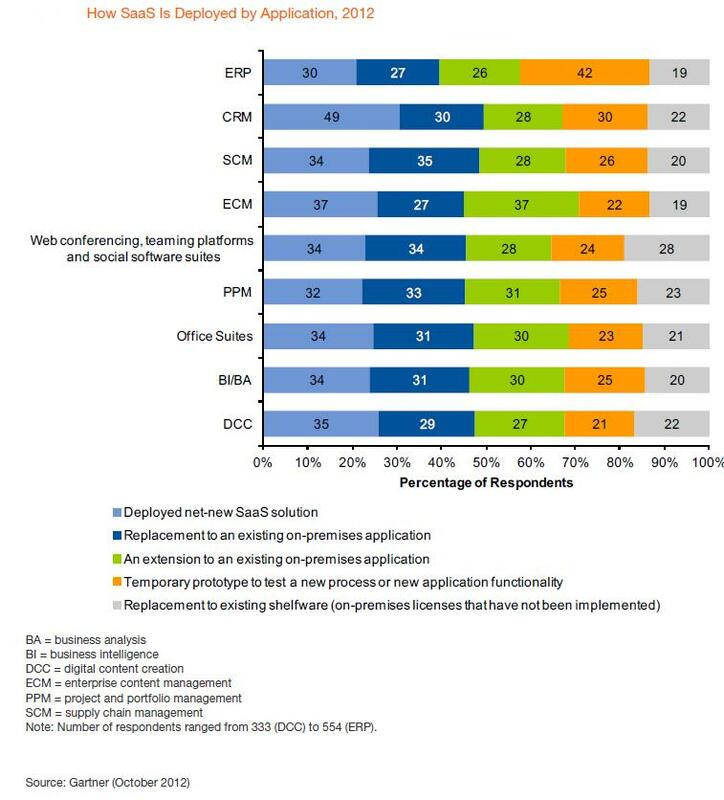 CRM is ascending rapidly in the priorities of CIOs in 2012, moving from 18th place to eight place in the latest Gartner analysis. 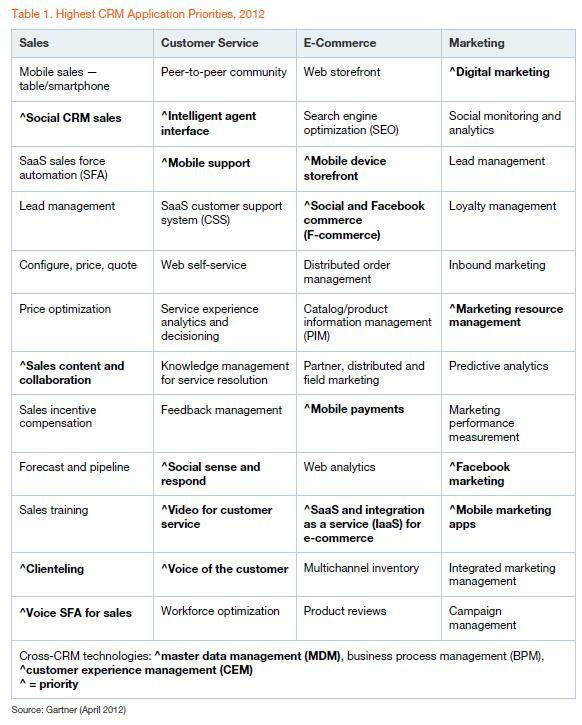 The following table of Highest CRM Application Priorities, 2012 show what’s trending within Sales, Customer Service, E-Commerce and Marketing inquiries Gartner is receiving from its clients. 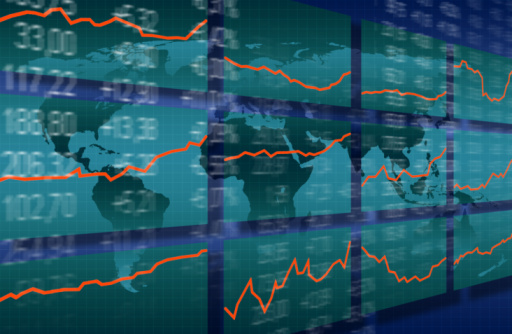 Consider these as leading indicators of interest. Over time these areas will need to solidify for forecasts to be completed. Apple iPads are the great maverick buy of 2012 with thousands being purchased by Sales and Marketing management with the immediate requirement of IT integration to these devices. 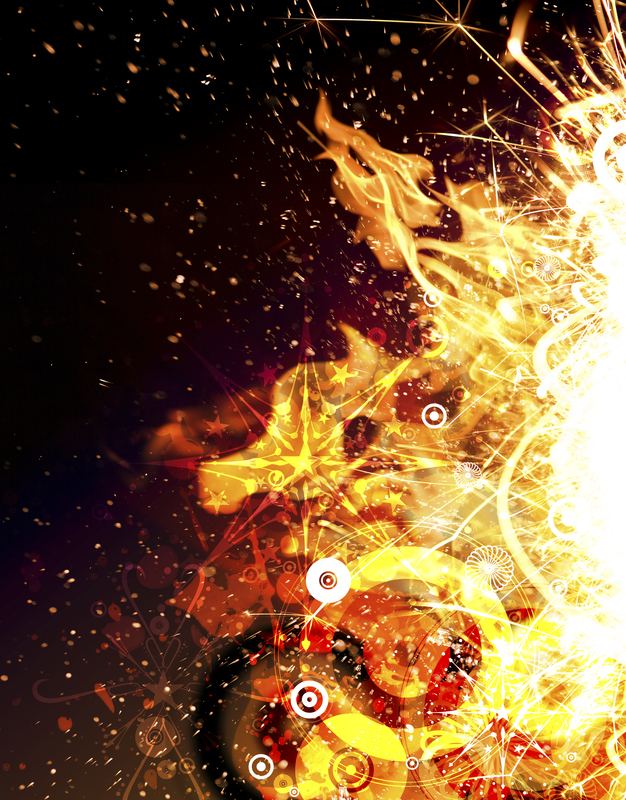 IT departments are scrambling on the security issues and lack of polices on BYOD. In enterprise software, iPads are proving to be highly effective as demo platforms for new SaaS-based applications. They have become the new sales bag of the 21rst century. High Tech, Life Sciences and Insurance are the three industries with the greatest levels of iPad adoption as of April 2012. Gartner is predicting that by the end of 2012, 80% of all sales representatives in the pharmaceutical industry will be using iPads for their daily sales tasks. Social or community customer service is the hottest area of growth for post-sales service with high-tech, media, travel, telecommunications, retail and education-based clients dominating client inquiries. From conservative, single digit adoption rates to hockey-stick projections of exceptional growth, analyst firms, venture capitalists and government ministries are weighing in on how they see cloud adoption progressing. While each of the adoption rate predictions vary significantly in terms of their methodologies and results, all rely on the assumption that SaaS applications including CRM will continue to gain momentum. The user adoption rates vary on how fast the momentum is, yet all share this assumption. Speed, increased user adoption rates, and the ability to more closely align software to business goals are cited most often as the biggest benefits. Where the projections vary most is whether enterprises will eventually migrate the majority of their applications to the cloud or not. Forrester, Gartner and others see a hybrid cloud architecture emerging in the enterprise and forcing the issue of legacy systems migration by 2015. 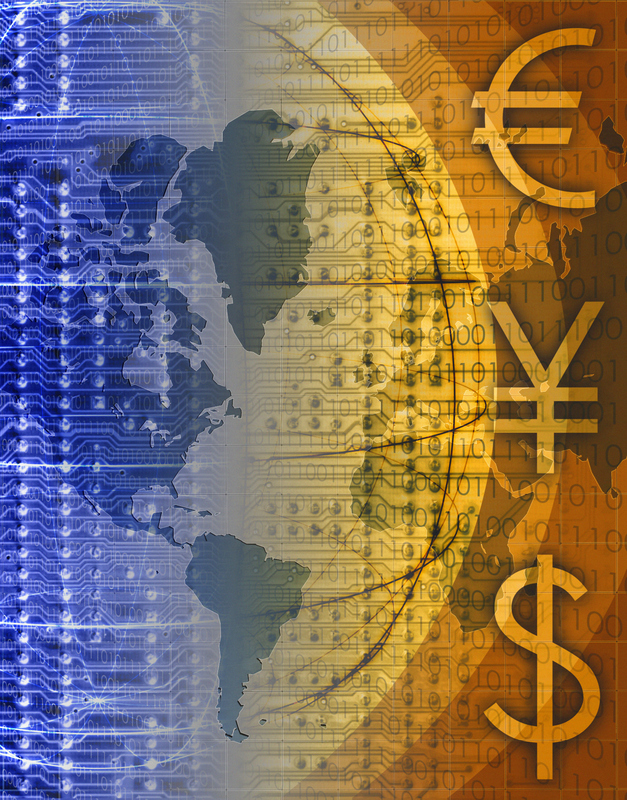 As would be expected, vendor-driven research sees an “all or nothing” world in the near future. Wanting to see how reliable the figures were showing rapid cloud adoption in the enterprise, I did a quick sanity check. Taking the distribution of sales by segment for Salesforce.com and their annual revenue growth rate, then normalizing it across all segments, enterprise emerges as their strongest segment by a wide margin in 2015. It had a 15%+ compound annual growth rate (CAGR) from 2011 – 2015 just taking their current sales by segment distribution of sales and extrapolating forward. 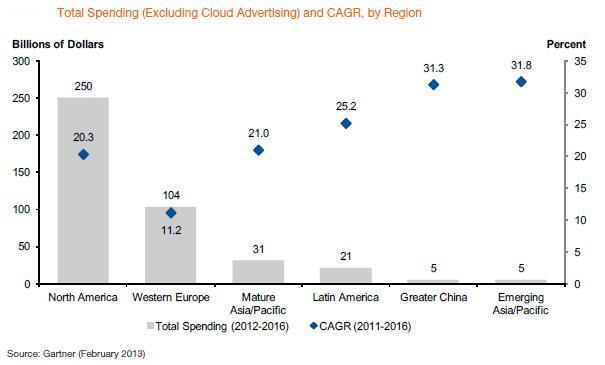 Data points like this and the market factors behind them is why SaaS is often used in these studies as a leading indicator of broader cloud adoption. 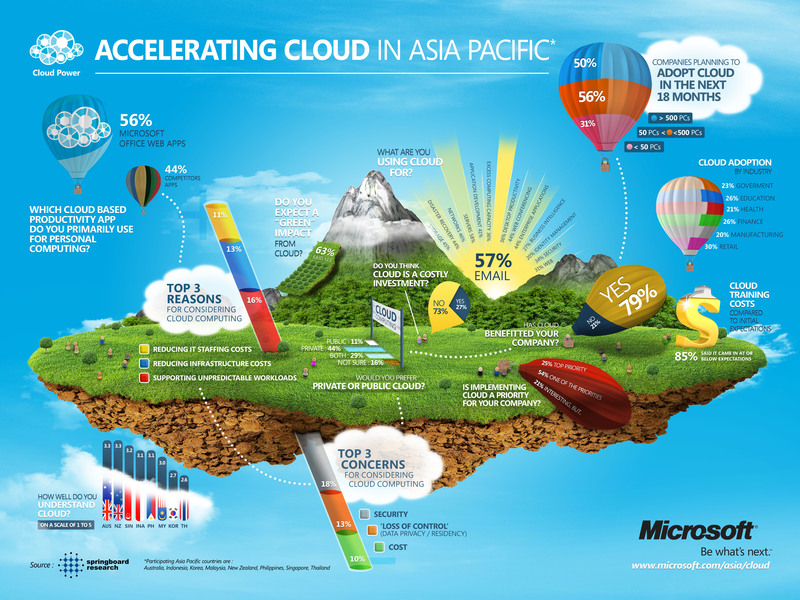 Springboard Research (Forrester) completed a study of cloud computing adoption in Asia finding 31% of companies with 50 or fewer PCs will adopt cloud-based applications in 18 months, 56% with up to 500 PCs. The key findings are available for download from the source URL below the infographic.